All Products > "25214331 Multiplex Kit Funcub XL"
• Numerous supplementary functions add to the versatility and fun. • Remarkably aerobatic / precise flying characteristics. 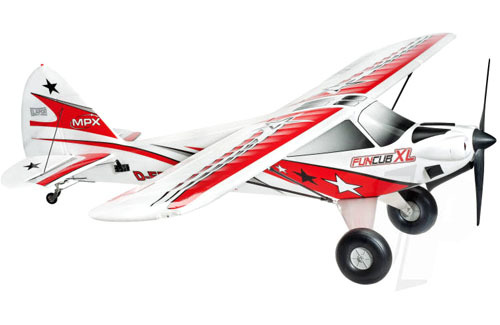 • Offset landing flaps enable steep descents and a short take-off capability. • Tundra tyres allow rough field operation. • 'M-frame technology' provides a robust fuselage. • Wing construction uses strong, lightweight carbon tubes for outstanding rigidity. • Suitable for aero-towing gliders (e.g. Heron-size). • Separate wing panels for ease of transport. • 1 x Elapor foam fuselage components set. • 1 x Elapor foam wings parts set. • 1 x Elapor tail parts set. • 1 x Elapor foam cowl. • 1 x Elapor foam canopy. • 1 x Tubular CFRP wing spar set. • 1 x Laser-cut plywood fuselage parts set. • 1 x Aluminium undercarriage unit. • 2 x Soft tundra wheels. • 1 x Plastic spinner. • 1 x 5mm diameter propeller driver. • 1 x Aero-tow release. • 1 x Small plastic parts and linkage components set. • 1 x Pre-cut decal sheet. • 1 x Comprehensive instruction manual.